Bomb blasts and other terrorist attacks has become every day business in Pakistan. Governments use terrorists as tools to maintain the dominance. Here is yet another incident. Onlookers stand over the site of a bomb blast outside a Shiite Muslim mosque in Hangu, February 1, 2013. ISLAMABAD — A suicide bomber apparently targeting Shi’ite Muslims blew himself up outside a mosque in northwest Pakistan, killing at least 21 people. Sectarian violence has claimed more than 400 lives in Pakistan last year.District police officer Mian Mohammad Saeed says the bomber detonated his explosives in a busy market outside a Shi’ite mosque in the northwestern town of Hangu, just as traditional Friday afternoon prayers were ending.He says that it was a suicide attack and that the bomb weighed some 6-7 kilograms (10-12 pounds). It happened in the main Hangu bazaar, outside the mosque as people finished their prayers and were leaving. The bomber was waiting outside and he attacked them. The Shi’ites were the apparent target, he says, but there were also Sunni casualties because they own shops in the area. The explosion is the latest large-scale attack targeting Pakistan’s minority Shi’ite community. 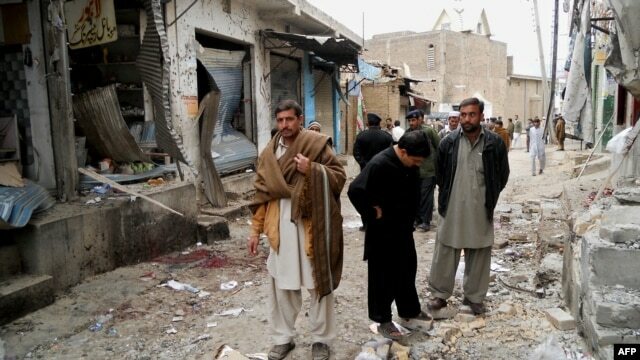 A double bomb blast in the southwestern city of Quetta last year killed 86 people, most of them also Shi’ite. According to the latest Human Rights Watch report, more than 400 Shi’ites were killed in targeted attacks across Pakistan in 2012. The New York-based rights organization says Sunni militant groups, such as Lashkar-e-Jhangvi, which claimed responsibility for the Quetta attack, operate openly across the country. Ali Dayan Hasan of Human Rights Watch says the Pakistani state has shown itself unwilling or incapable of cracking down on the Sunni militant groups that are targeting Shi’ite civilians. “Certainly many of these groups espouse a political ideology and religious theology that simply does not recognize the Shia as Muslims, and sees them also in many instances as agents of Iran. There are unfortunately elements within the Pakistan security establishment that subscribe to that kind of view,” he said. Hasan said there is also collaboration between the Sunni militants and anti-government Taliban groups seeking to replace the current Pakistani government with an extremist leadership. According to Human Rights Watch, the deadly attacks on minority groups show no sign of letting up in 2013. BASELINE: PAKISTAN GOVERNMENT OFFICIALLY FINANCE MASS MURDERS AND GENOCIDE OF ITS NON MUSLIM MINORITY. THEY ALLOCATE A MAJOR CHUNK OF BUDGET FOR TERRORIST AND GENOCIDAL ACTIVITIES. AS AN AUTHOR OF THE ARTICLE I HAVE EVIDENCE THAT THEIR PARLIAMENT SUPPORT TERRORISM OFFICIALLY. IRONY IS THAT THEY USE THE SAME MONEY FOR ATTACKS LIKE 9/11 AND 26/11 WHICH THEY GET FROM CIVILISED COUNTRIES AS ALMS AND AIDS. Posted on February 2, 2013, in Uncategorized. Bookmark the permalink. Leave a comment.